The point is clear enough but few of us really have the opportunity to work from a blank piece of paper. With the exception of new lenders, most of us are dealing with established businesses with established value chains and processes. So how disruptive can technology really be in financial services? There are two ways technology can change our lives. The first by being brand new — technologies such as the phone, the plane, television and computers. The second is by radically transforming an existing industry — like the shift from storage mediums like records and DVDs to all-digital devices. No industry is safe from the possibility, and reality, of disruption. The gradual re-wiring of financial services got underway in 2005 with UK-based Zopa and hasn’t looked back since. There is arguably a small but significant growth in the ecosystem of next-generation lenders that is now sprouting a number of niches. One of those niches is mortgage lending. But while the headlines are generally about the front end re-wiring of lending, the overall impetus has stimulated the entire value chain to re-examine itself and look to improve. This is not a process re-engineering however it is ongoing business re-engineering. Within the context of re-wiring old models, what has become obvious is that the advent of agile technology and bigger data means that intermediated chains of any sort are open to more scrutiny and ultimately more questioning. However it is not all one-way traffic. Just because a business sees an opportunity to re- model the way something is achieved does not mean customers will respond in kind. Brokers offer an excellent example of how expertise and experience can achieve things for time poor customers that the market itself will not deliver except in the most vanilla of products. 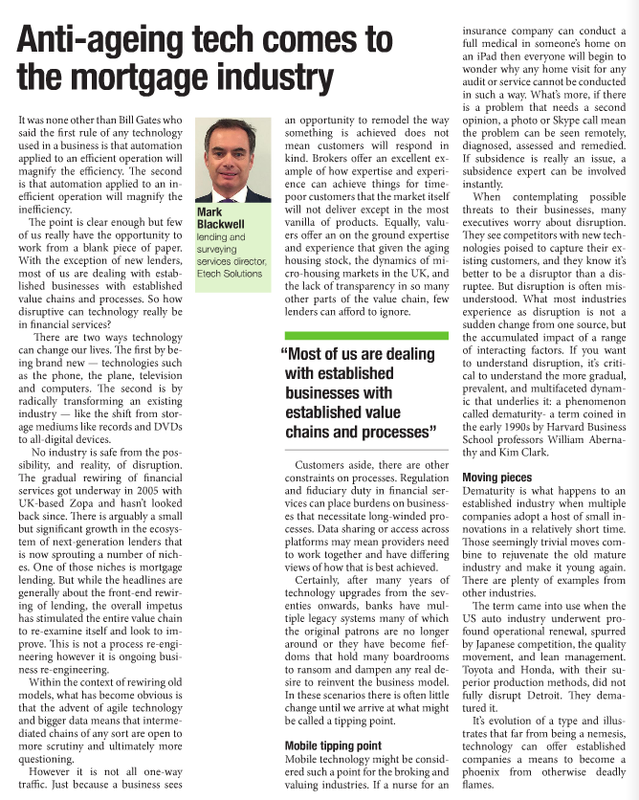 Equally, valuers offer an on the ground expertise and experience that given the aging housing stock, the dynamics of micro housing markets in the UK, and the lack of transparency in so many other parts of the value chain, few lenders can afford to ignore. Customers aside, there are other constraints on processes. Regulation and fiduciary duty in financial services can place burdens on businesses that necessitate long-winded processes. Data sharing or access across platforms may mean providers need to work together and have differing views of how that is best achieved. Certainly, after many years of technology upgrades from the seventies onwards, banks have multiple legacy systems many of which the original patrons are no longer around or they have become fiefdoms that hold many boardrooms to ransom and dampen any real desire to reinvent the business model. In these scenarios there is often little change until we arrive at what might be called a ‘tipping point’. Mobile technology might be considered such a point for the broking and valuing industries. If a nurse for an insurance company can conduct a full medical in someone’s home on a Ipad then everyone will begin to wonder why any home visit for any audit or service cannot be conducted in such a way. What’s more, if there is a problem that needs a second opinion, a photo or Skype call mean the problem can be seen remotely, diagnosed, assessed and remedied. If subsidence is really an issue, a subsidence expert can be involved instantly. Dematurity is what happens to an established industry when multiple companies adopt a host of small innovations in a relatively short time. Those seemingly trivial moves combine to rejuvenate the old mature industry and make it young again. There are plenty of examples from other industries. The term came into use when the U.S. auto industry underwent profound operational renewal, spurred by Japanese competition, the quality movement, and lean management. Toyota and Honda, with their superior production methods, did not fully disrupt Detroit. They dematured it. It’s evolution of a type and illustrates that far from being a nemesis, technology can offer established companies a means to become a phoenix from otherwise deadly flames.